The Beantown Bloggery: Contest: Shecky's Girls Night Out Tix! Shecky's Girls Night out is coming here next week from Wednesday to Friday (Aug 12th-14th, 2009). The event is going to be held at the Cyclorama, like last time, in the South End. Based on my previous post (here) it seems that many of you have been and had a decently good time there. It's been a while since I've given anything away, let's kick August off with a giveaway. I've got three pairs of tickets to giveaway to three lucky readers. Contest rules are the same as usual, send me an email with "Shecky's Girls Night Out" in the subject heading and your full name in the body of the email and I'll enter you into the drawing for a pair of free tickets to the event. "Enter to win a pair of Famous Goodie Bag tickets* for you and a friend to Shecky's Girls Night Out! 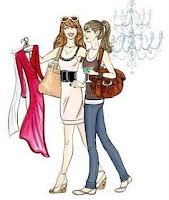 Indulge in five hours of cocktails, beer pairings, amazing fashion deals, fab freebies in Shecky's Famous Goodie Bag, and the best time ever with your BFF's!" *Tickets may not be redeemed for cash. Shecky's is not responsible for lost or stolen tickets. Duplicate or tampered tickets will not be honored. Must be 21 or older to attend. Proper ID will be required at the door. Contents and value of individual Goodie Bags vary. Ticket valid for one time use only. Contest starts now and runs until Friday 8/7 at 10pm EDT. 0 Response to "Contest: Shecky's Girls Night Out Tix!"